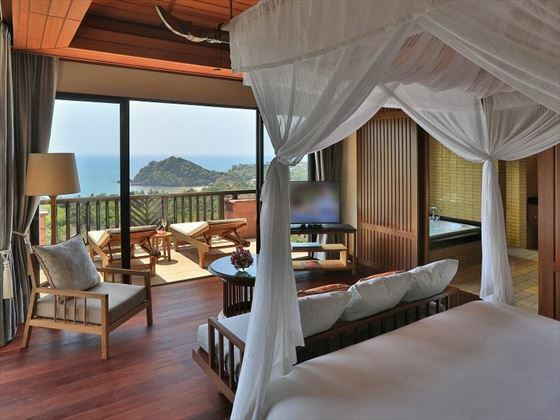 Far away from the hustle and bustle of neighboring beach resorts on Koh Lanta, Pimalai offers guests a more refined and elegant approach to relaxation with numerous luxury facilities and award-winning spa services to help you recline as the mood dictates. 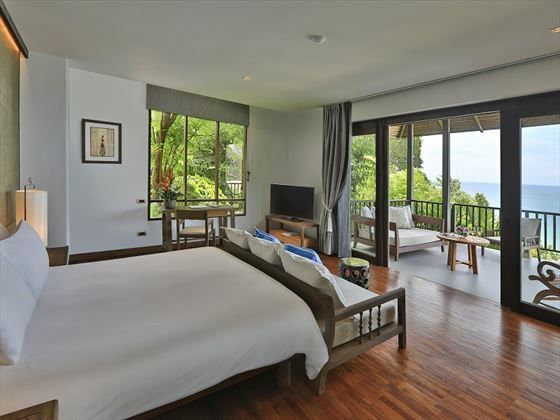 With some stunning hillside and beach locations, guest accommodation is second to none with spacious private retreats promising some sublime sea views as well as numerous carefully chosen Thai silk and cotton comforts. 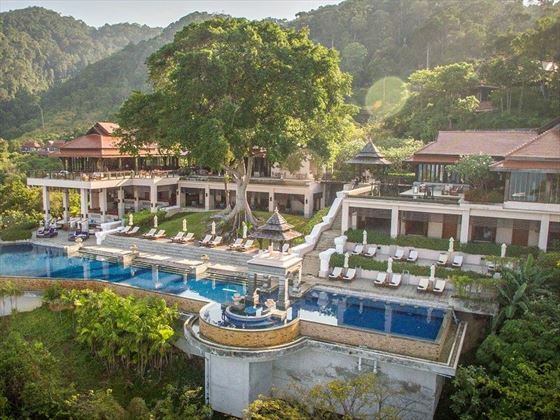 Once you've managed to tear yourself away from your abode you'll discover a rich vein of European and Asian elegance running through the resort with fine dining, fine wines and fine company adding to what is an exceptional glimpse at 5-star Thailand. 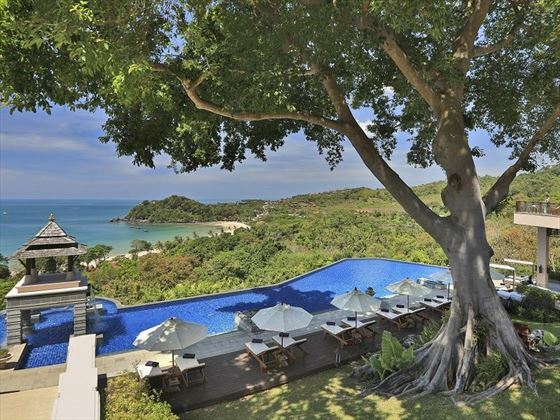 Further reading: Pimalai Resort & Spa is featured in our guide to the top 10 luxury hotels in Thailand. 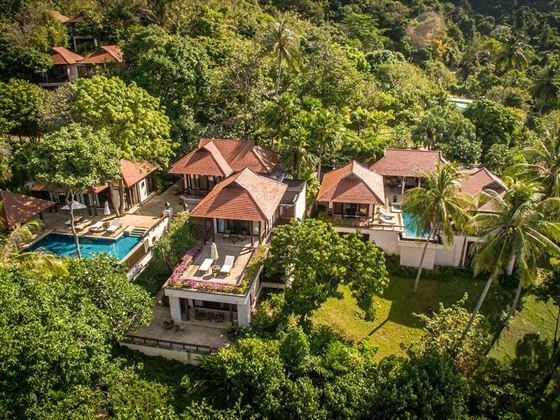 Situated on the beach, within 100 acres of lush green hillside on the lesser-visited southern tip of Koh Lanta Island which lies just offshore from Krabi on the southwest coast of Thailand. 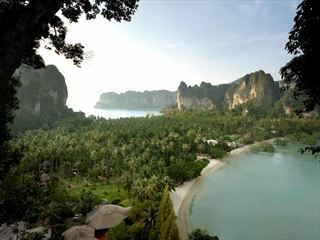 Complimentary transfers take you from Krabi Airport to Pimalai, this takes approximately two hours by mini van and speedboat to the resort, exclusive to guests. 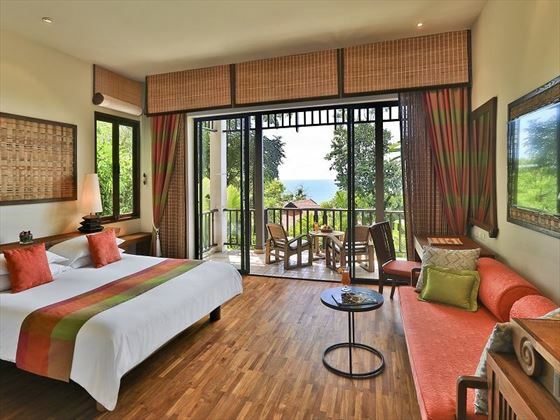 Deluxe Rooms – bright and natural colour scheme with teak wood flooring, one king-size bed or two twin beds, day bed which also serves as an extra bed and partial sea views from the private balcony. Bayfront Deluxe Rooms – larger than Deluxe Rooms with one king-size bed and similar bright and elegant Thai décor. Pavilion Suites – larger than Bayfront Deluxe Rooms with either one or two bedrooms as well as one or two bathrooms, living room and spacious garden area with outdoor shower and large wooden veranda. Pool Villas – almost double the size of Pavilion Suites and set over two storeys on a verdant green hillside overlooking the ocean. Villas contain one king-size en-suite bedroom, an infinity pool, Thai sala, fully equipped kitchen, living room and sundecks. 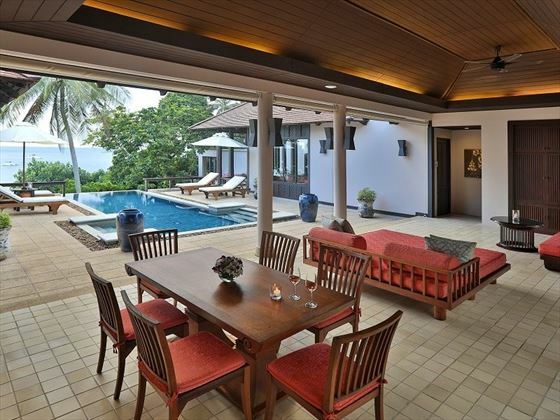 Beach Villas – larger than Pavilion Suites with one, two or three bedrooms, private infinity pool, living room, dining room, fully equipped kitchen, large bathroom with outdoor shower and bathtub, access to shared villa swimming pool and are situated right on the beach or one row back with elevated views. 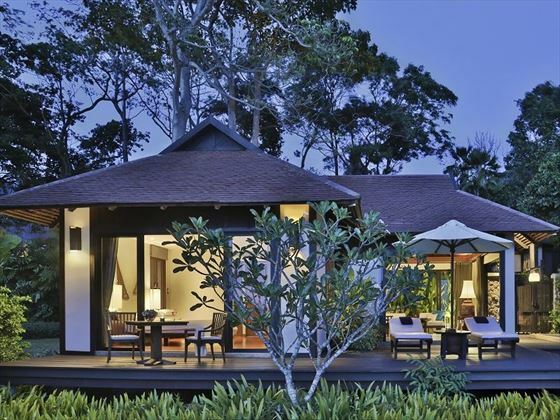 The Hillside Ocean View Pool Villas one, two & three Bedrooms are situated some 60 to 80 meters above sea level in a serene rainforest and offer unrivalled ocean views, magnificent sunsets and all round great privacy. A shuttle service is provided to take you down to the lower part of the resort or at the beachside and of course back to your hillside villa whenever needed. As a reminder all the villas (Beachside villas two & three bedrooms & Hillside Villas one, two & three bedrooms) have a steep drop-off from the infinity-edge pool. Spice 'n' Rice – classic Thai dishes using locally sourced ingredients and organic produce from the resort's vegetable garden. Seven Seas Wine Bar & Restaurant – a la carte European cuisine served alongside a superb choice of international wines and tropical cocktails. Rak Talay Beach Bar & Restaurant – grilled seafood, sandwiches, light lunches and cocktails as the sun sets over the ocean. 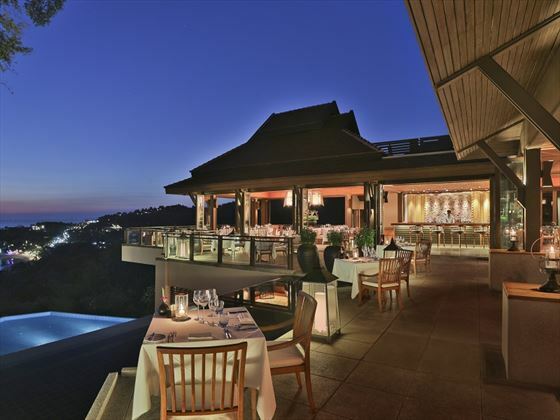 The Banyan Café – pizzas, pastas, salads and wine cellar decisions by the pool. 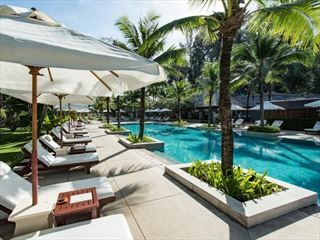 Pool Bar – light bites, drinks and sunbathing by the pool. Lobby Bar – pre and post dinner drinks and cocktails in a stylish open air pavilion. Private dining – choose to dine in the comfort of your own room or at a romantic candlelit sala on the beach. Pimalai Spa – award-winning spa services in traditional thatched Thai salas on the beach; massages, beauty treatments and all over body wraps, not to be missed. The Pimalai Fitness Suite – state-of-the-art gym equipment for a full body workout. Non-motorised watersports: snorkelling, canoes, windsurfers, paddle boards, boogie boards and sailing boats. Honeymooners staying for a minimum of 3 nights will receive a bottle of sparkling wine, honeymoon cake and flower bed decorations. 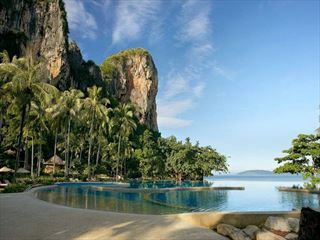 Last minute offer Book and stay before 30 Apr 19 and receive a special discounted rate. Saving you up to $900 per couple. Valid in all room types. Stay between 09-13 and 21-30 Apr 19. Combinable with honeymoon offer only. Special offer Stay in a Deluxe Room for 3 nights or more and receive a special discounted rate, Saving you up to $200 per room. Book by 30 Jun 19. Valid when travelling between 1 – 30 Jun & 1-30 Sep 19.